In this internet-connected world, it’s become more important than ever to keep our information safe. Whether it’s personal or work-related, our data is always at risk of falling into the wrong hands. On a basic level, encryption is one of the best protection methods available to keep all your digital assets safe. The encryption process uses a key and an algorithm to transform the accessible data into an encoded piece of information which can only be deciphered by authorized persons. Encryption helps you secure sensitive information from cyber criminals or other online threats and make access harder to them. At the same time, it’s a way that can be used to archive large amounts of data or to secure private communication over the Internet. According to “The 2019 Global Encryption Trends Study” released by the Ponemon Institute, 45% of the organizations surveyed said they have an encryption policy in place to secure the most important data. Both Internet users and organization can do that with the help of free encryption tools which can enhance protection by keeping valuable information hidden from malicious actors. Encryption is essential to protect critical data, no matter if it is stored locally, on the PC, or sent over the Internet. So which are the encryption tools? We’ve put together this list of free encryption software to choose from. Before we jump to these encryption software products available for free, we outline the importance of always using strong and unique passwords for all your online accounts. When setting up your encryption process, you’ll be asked to choose a password as your decryption key. Before you do that, make sure you apply these actionable security tips to manage passwords like an expert and make them more secure and unbreakable by cybercriminals. Set unique and strong passwords, which contain different characters, like uppercase and lowercase letters and numbers, and are more than 15 characters long. There are several tools you can use to test if your passwords are strong enough. Also, you’ll need to set passwords which are not easy to remember or guess, and aren’t used for more than one online account. Do not share your passwords in emails, instant messages or other online platforms. We carefully curated and put together some of the best free encryption software tools you can use to keep your most valuable data safe and secure. Probably one of the most popular password manager tools out there, LastPass can be used for free with limited features, but will still secure your passwords and personal data. Using an encryption software tool like this one, you’ll no longer have to remember or note a password in a notebook or any other physical place. LastPass comes with an easy-to-use and intuitive interface and can simplify things for you. There are extensions available for the main web browsers, such as Mozilla Firefox and Google Chrome. Also, you can use the mobile app available for both Android and Apple. When you create a new online account, it offers the option to save the new credentials. This tool encourages you to set a unique and hard to break password and discourages users to reuse it. If you’re using the same password for multiple accounts, it simply recommends selecting a different password. Other password management tools you can use Sticky Password or RoboForm come with an intuitive and easy-to-use interface and can provide good password security. To safely manage passwords, we encourage users to follow these security steps included in this guide and use the use two-factor authentication system, whenever possible. While there are many encryption tools available you can use to encrypt your data locally, most users prefer to use Microsoft’s BitLocker software. You can either use it to encrypt a particular disk partition or the entire hard disk. BitLocker is a full-disk encryption tool built-in in the latest Windows operating systems (Windows 10), which uses AES (128 and 256-bit) encryption to encrypt data on the drives. The Advanced Encryption Standard has been tested and improved and is now used worldwide by the most security vendors due to its high level of security and optimization. It’s a free data encryption software tool you can use to prevent data breaches and data exfiltration from your hard disk. It encrypts your entire drive, which makes it impossible for malicious actors stealing your laptop to remove the hard drive and access your files. 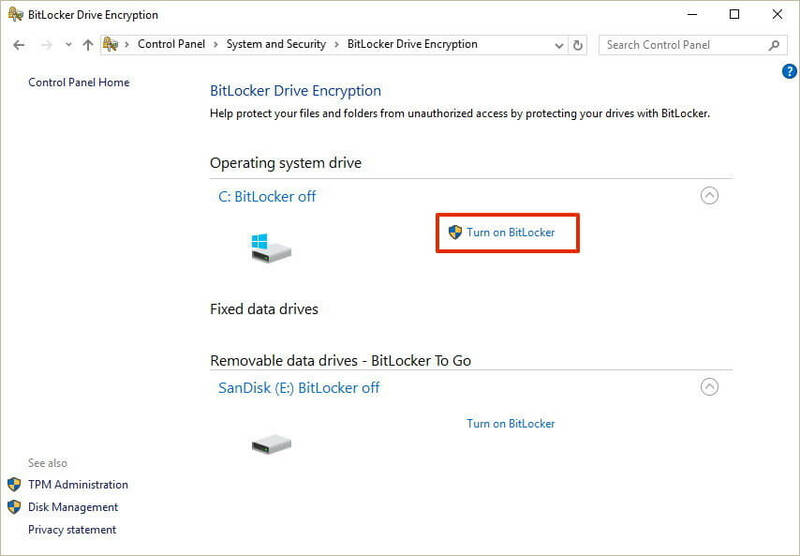 When BitLocker Drive Encryption is activated, and you add new files, BitLocker will encrypt them automatically. Another free encryption software tool you can use which is available for Windows, OS X and Linux operating systems. Just like BitLocker, it supports Advanced Encryption Standard (AES) and can hide encrypted volumes within other volumes. It is an open source program which means developers and researchers can download and use the source code. This encryption software is a great alternative to TrueCrypt tool and is constantly getting improvements and security enhancements. 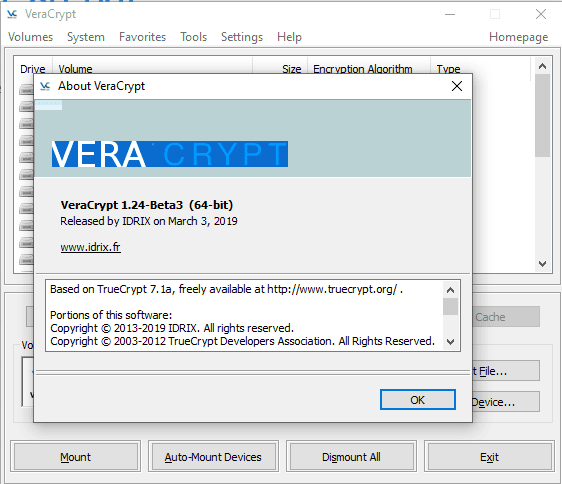 VeraCrypt 1.24, the upcoming next version of VeraCrypt is currently available for beta tests and can be downloaded from here. The new version is expected to come with lots of security and functionality improvements to better secure users’ data. Looking to encrypt your data stored on devices featuring macOS and Mac hardware? FileVault 2 is a free encryption software tool we recommend checking out. Just like BitLocker and VeraCrypt tools, FileVault 2 (FileVault full-disk encryption) uses XTS-AES-128 encryption with a 256-bit key “to help prevent unauthorized access to the information on your startup disk”. If you’re interested in installing it on your Mac computer, this guide will come in handy. Yet another open-source and free encryption software you can use to secure your internal and external drive, including system partition, and even ISO images, or USB flash drives or any other storage devices. Just like BitLocker, it is a full-disk encryption tool for Windows OS and includes multiple encryption algorithms such as AES, Twofish, and Serpent. The interface is simple and intuitive, all you need to do is select the drive and click on “Encrypt” to protect your data. Many users are not interested in encrypting the entire hard disk, but only specific files and documents that store sensitive information. It’s a free and open source encryption software, as well as a lightweight solution known for its simplicity. This software tool is capable of extracting most archives and features strong AES-256 encryption. After the critical security vulnerability that affected all WinRAR versions and other programs, a stable version of 7-Zip 19.00 has been released and can be downloaded from the 7-Zip site. Similar to 7-Zip, AxCrypt is an open source file encryption tool offering both a free solution and a premium version for Windows, macOS, Android, and iOS. It features AES-256 file encryption and can efficiently encrypt one file, an entire folder or a group of files with a simple right-click. Files can be encrypted for a specific period of time or can be auto-decrypted later on when that file reaches the destination. So, how can I increase my online security without creating too many barriers that may slow down my access to the information posted online? See below a few simple tools you can use to access online content and stay safe from data breaches at the same time. Encrypting your files is not enough. To be one step ahead of cybercriminals, you need to enhance online protection, you need to make sure no one can eavesdrop on your communication over the Internet. To make sure you always access secure web pages that use encryption mechanisms, we recommend trying a browser extension like HTTPS Everywhere, which is compatible with Mozilla Firefox, Opera, and Google Chrome. The extension was created as a collaboration between EFF and Tor Project, and automatically switches from unsecured sites using “HTTP” to secure “https”. Using an extension like HTTPS Everywhere, which encrypts your communication with major websites you access on a daily basis, will make your online activities more secure from multiple online threats. If you want to access the Internet anonymously, Tor browser can be a great option to encrypt your online traffic and keep your browsing activities from prying eyes. Tor Browser will block popular browser plugins such as Flash, RealPlayer, Quicktime, and others which can be manipulated into finding out your IP address. It is recommended not to install additional add-on or plugins into Tor Browser, because it may bypass Tor and compromise your privacy and security. The special Tor browser has been designed to be used by anyone who wants to conceal any browsing activity from prying eyes. The most recent version of this browser, Tor Browser 0.4.0.4, is in the release candidate available for download, and it fixes several bugs from previous versions. For those who don’t know, Tor is the short version of “The Onion Router” and directs your Internet traffic by encrypting the IP address from where it came. Using encryption software like Tor will make it more difficult for your online activities to be traced by malicious actors. Another way to hide your online identity is to use a VPN (Virtual Private Network) which can encrypt your communication and keep it safe from constant interception attempts. This private network is able to spread across the normal Internet space, using its resources to create an encrypted channel and protect your data from hackers or the prying eyes of others. It uses strong encryption mechanisms to hide your IP address, secure banking transactions, or keep yourself and your information safe when accessing Wifi networks. A VPN software program like Cyberghost can be used when trying to connect to unsafe public networks or when needed to access content whose distribution is restricted to a certain geographical area. You can browse in a private mode from another country and get access to more than 1,000 servers across 50+ countries. CyberGhost is a popular VPN solution to ensure that your web traffic and valuable information remain encrypted. It is the winner of the “Best Value” category at the BestVPN.com Awards 2019. It includes a 30-day money-back guarantee for everything else and friendly support. A VPN service provider like Cyberghost helps you keep your data protected and secure your digital assets. Cyberghost works with Windows, macOS, iOS, Android, Linux or routers. For privacy enthusiasts, here’s another VPN service you can use to encrypt your data and keep cybercriminals at bay. Similar to CyberGhost, this one uses 256-bit AES encryption technology and the set-up is simple. Simply download, install and connect to ExpressVPN with a few clicks. When it comes to securing your most important information, encryption is not enough. Oftentimes, in our blog articles and protection guides, we often emphasize the importance of using multiple layers of security to be one step ahead of hackers. Keep your browser and operating system updated with the latest security patches. Make sure you have the latest versions running on your system. Online criminals spread malicious tools by using security exploits to take advantage of your system’s vulnerabilities. Patching is key, as the experts said it again and again. Use a reliable antivirus product, and consider adding multiple layers of protection and use proactive cybersecurity software like our Thor Premium Home, which provide complete, all-in-one protection for your digital life. Be very careful when connecting to public and free wireless networks. One of the favorite methods used by online criminals to retrieve your credentials is to use wireless sniffers to access data you send over unprotected networks. Education remains the main key to better secure your digital assets, so we recommend checking out our free educational resources and signing in for any course that will teach you more about online protection. When you think about encryption, have in mind the entire picture and know how important its role is in the overall security strategy. What about you? How do you see encryption in the bigger picture of Internet security? Are you using any type of encryption for your data at the moment? My favourite so far is NordVPN: nordvpn.org/HAPPYNORD. As good as ExpressVPN except Nord is much cheaper. I’m not looking for bargains in what comes to cyberSec, but why not save some where we can? Thanks for the detailed article! How nice of your to provide this information.Thank you so much. Every day I process personal data and documents. It has to meet the requirements of GDPR. A month ago, I bought FPS and I am very pleased. I had never worked with something so good. Now I want to buy a higher version, but I do not know where to do it. I bought LE from Microsoft Store ( https://www.microsoft.com/en-us/p/file-protect-system-le/9pm7vn21sk42?activetab=pivot:overviewtab ), but they do not sell SE there. If anyone can help me, I’ll be grateful. Please do not offer me another solution. I’m looking for a specific product. My work requires it. Bitlocker? Really? Apparently you haven’t read much about encryption software in the news. It has been suggested on multiple fronts that this software has a backdoor, and being that is is NOT open source, cannot be trusted. You should do your research first before recommending this software. Thumbs down on this review. Thanks for this great article. Love your detailed account about data encryption and valuable information on encryption tools like BitLocker, Veracrypt, FileVault2 and many more. Given that the most viable means of storing data is in digital form, especially on the cloud, stringent security measures are warranted at all times. Encryption is a great way to ensure the safety of sensitive data. Interesting article, I am looking for a VPN for my macbook air. I am unable to find some good ones because most are paid and the free ones, I am afraid will tap my data. I use for basic blogging. I am currently using tunnelbear, do u have any suggestions that would be better than tunnelbear ? Windscribe offer up 10gb free. Or you can use Tor browser but this will only apply to that web session. Exactly – Do not panic! In bulk situations, deleted files can recreate – even if you have cleared the trash or did not used the trash when deleting files. For successful recovery lost data it is necessary execute specific actions. Do not be discouraged – for this, it is not necessary to be an expert in the field of information technology, you also do not need to pay hundreds of dollars to a specialist professional for restoration of your remote information. try bulambod encryption its freeware… you can download from here http://www.softpedia.com/get/Security/Encrypting/Bulambod.shtml. have a nice day. Do you also write a review about paid encryption softwares? Hello! This is a good idea, thanks for sharing your thoughts! We can also write some about the paid encryption software, will think about it! Thanks for reading our blog! I use get2clouds to encrypt before upload something to the cloud. It’s super easy and free!! Hello. Thank you for a very interesting publication. I want to say that I often have to use the software. I like that the necessary programs are downloaded here https://veadug.com/en/ absolutely free. Hi, I’m using kruptos 2 Pro along with android version and great product. It’s good combo between my mobile and PC when moving files around. Hello, Chad! Thank you for sharing your thoughts! I didn’t know about this product, will consider adding to the list. Thanks for reading our blog! I tried to download Heimdal and after going through all the steps Heimdal said my email address is not valid. Then all trace of Heimdal disappeared from my C:/drive. Hello? What’s up with that? Don’t answer. I’ll use a different application. Hello, Phyllis! Sorry to hear that! If you still encounter issues, please write us at support@heimdalsecurity.com and our team will answer you in a timely manner. Thank you! They have several encryption apps and simple user guides. these are the best tools to use for encryption. Thanks for sharing this. Many thanks for your feedback, Angelina! Happy to know it was useful. Thank you Angelina for the support. If you want more tools and tips, feel free to subscribe to our newsletter, we strive to provide the best educational resources for cybersecurity. is there any current encryption tool? i found best list of tools for encryption here. In my opinion this is the best free file encryption. Using AES its incredibly secure. veraCrypt not supporting TrueCrypt files, why? On my side bit lockers works fine, Thanks for sharing in-detail. I also some interesting new tools on comment section. Thank you very much, Andra! Extremely helpful and very practical. Appreciated. Thank you for providing this useful post which is really helpful for me in encryption side. Your article was quite awesome to read. I am developing web service using IBM iseries server and components and I want to allow user to call web service to get information. do you know, how do we encrypt data before sending it over web to web client? do we need to encrypt / decrypt data programatically? Sorry, but I can’t provide advice on such topics, because I don’t know the situation and we don’t do consultancy. But I’m sure you will find the best fit for your needs. Best of luck! Which of your recommendations, or some other specific alternative, can be used on Windows 7 ? And do any of your recommendations require a recipient (of an encrypted emailing that I send) to have compatible decryption software in order for the recipient to read the emailing? Can the copies of all past emails already existing in my computer be changed to encrypted format? How? Using what? What specific things did you find difficult to understand, Jimmy? oops, scuze, am uitat. Aplicatia de care am nevoie este pentru criptare / decriptare asimetrica. Thanks! it a good website but can i know what the best tool for encrypt the blog? Would there be any advantage to compressing everything before encrypting it? Hi Jerry! Compressing your filed before encrypting them will help the encryption process go faster, because encrypting smaller files requires less resources. Also, compression can add a entropy, which is helpful against known-plaintext attacks. i’m still using TrueCrypt ….. itz amazing…. It’s really important to encrypt your internet traffic, and the tools you have mentioned pretty interesting but how we encrypt your internet traffic is really interesting as well. I think everyone should know such information like you have described on this post. On this software tools are very software developers including me. Just the minute before i use Tor browser to check my website full report and very easily to get. It is really a great and useful piece of info. Dear Andra, thank you for the post. There is one more tool that achieves your security goals but skips your description: WinGPG, absolutely free open source encryption soft. It would be great if you add it to your list and try out. It operates on gpg/pgp with simple yet powerful GUI. It’s manageable and easy to use so anyone could get use of it. . The link to the product: http://scand.com/products/wingpg/index.html. Thank you! Thanks a bunch for the suggestion, Alexandra! I’ll take a look and see if we can include it in the list. I downloaded both the 32-bit and 64-bit portable versions, and looked at the maximum length of the key for each app. It was a paltry 3072-bit! I have already read about how someone has cracked 4096-bit PGP keys, so anything less than that is not worth my consideration. @other human: Not cracked! All they did was listen to one CPU’s crystal and decrypted one key. I bet it took them months to get the key. By that time I would have moved the file to a whole new computer that uses a new encrypted password. So, you would have to decrypt the new computers password and then enter in the files key. Great write up! I am currrently using axcrypt but i think i am moving on to Cloakapps soon. Much more convenient because i dont have to remember any passwords and the UI is just clean IMO. And Cloakapps is free. Win. Your article was quite awesome to read. Thank you andra for providing this useful post which is really helpful for me in encryption side. So glad you found this guide useful, Anjana! I hope you’ll have time to explore some other security guides we published as well. I agree, Anjana. I design encryption courseware (for both business & academic audiences). You knowledge and writing style demonstrate that you are a good educator. You have a knack for zoning in on the critical or less understood issues and making them clear. Great job! Most all of this article was new to me and thus very useful. Thank you. Under the discussion of passwords there was not any mention of two step authentication. By default Google at the time I set it up had this turned off by default. Now I see it used by my bank and several others. It is a little off the topic here, but could be put under the Last Pass section. How much security does this method have and is there anything that can be done to make it more or less secure? Thanks again for your comment! Really appreciated. Maybe you can try Cloak Apps (https://cloak-apps.com/download.shtml). Cloak app is a file encryption tool while Vault offers user controlled file distribution. It works on Mac, Android, Windows and iOS. Check it out. Update: The current version of VeraCrypt (1.0f) does support import of TrueCrypt files. Agree… I was about to say the same thing. But you don’t want to turn on that feature when encrypting new files. It should be used only for decrypting OLD Truecrypt files.